The start line for the marathon, half marathon, and marathon relay is located at the intersection of Main Street and 7th Street in downtown Tulsa. Participants will proceed south on Main Street from the starting line. Please plan to arrive early to familiarize yourself with the start area. Porta-potties are located throughout the start area near each corral, at the finish area in the Tulsa Arts District, and at many points along the course. We know you’ve gotta go when you’ve gotta go, but please be patient and allow plenty of time to use the restroom prior to the race. There are likely to be lines on race morning. Lose your timing tag, forget your race number, or just need some help with morning logistics? Head to the information tent. Stash your (non-valuable) stuff with us! Gear check is located at the corner of 6th Street and Boston Avenue. You can pick up your gear after the race as you leave the secured finish area on M.B. Brady Street just east of Martin Luther King Jr. Boulevard. NOTE: ONLY THE CLEAR PLASTIC BAGS PROVIDED AT PACKET PICKUP WILL BE ACCEPTED AT GEAR CHECK. All participants checking gear must attach the gear check tag from their race number to the clear plastic bag for identification purposes. NO other bags will be accepted. Tulsa Route 66 Marathon, Inc. is not responsible for lost or stolen items, so we recommend keeping your valuables at home. 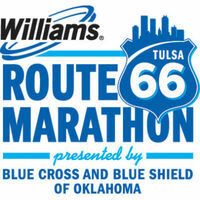 The Williams Route 66 Marathon knows hydration is extremely important on race day. That’s why we are proud to serve both Gatorade and water at all Gatorade stations on our courses. Gatorade stops are located approximately every 2 miles on the course for the first 20 miles of the marathon and every mile thereafter from miles 21 through 25. Participants who find themselves unable to finish the race should notify someone at the nearest relay shuttle exchange location (spaced approximately every 5 miles). You can ride a relay shuttle bus back to the finish line if you drop out of the race. In case of a medical emergency, please notify the nearest aid station volunteer for assistance. All results are unofficial until certified by race officials. Participants can check their unofficial results at the Results Tent. Unofficial results will also be posted online at www.route66marathon.com as the race progresses. Race officials will post final results online following certification. Participants and their friends and families can also follow participants’ progress and receive updates via the Williams Route 66 Marathon mobile app.